This is the simplest form of Bengali fish curry which can be made with any fresh water fish. It is frequently prepared in Bengali homes. Rohu is a fresh water fish that is cut into to Bengali style pieces which means the slices of the round fish are halved. 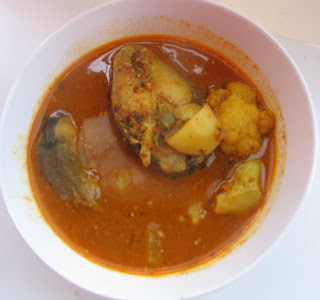 In most Bengali fish curry recipes, the fish is first cleaned and then turmeric and salt are rubbed on to it. This process is necessary since turmeric has antiseptic properties and it nullifies the affect of impurities clinging on to the fish. Salt is for seasoning and a preservative, to keep the freashness intact. Rub turmeric and salt to Bengali style, cut pieces of Rohu. Keep it aside. Heat mustard oil in a pan, once it starts smoking, shallow fry the fish. Remove the fish and set aside. In the same pan, shallow fry the cauliflower and potato with some turmeric and set aside. Make a fine paste with tomato puree, ginger, green chilli, onion seeds, cumin, mustard seeds. In a pan, add in the tomato paste and cook for five minutes on medium heat. The tomato puree should be fully cooked and the mixture should leave the sides and separate from the oil after five minutes. Now, add in the cauliflower and the potato, stir and cook for three minutes on medium flame. Keep stirring. Finally add in the fish that was shallow fried and kept aside earlier. starts separating from the bone. Be careful while stirring the curry, so that the pieces of fish do not break. Cook for another two or three minutes on low flame. Turn off the heat. Serve hot with luchis or steamed rice.